Born in Athens, Greece, in he took piano lessons at the age of 9 and at 17 he joined The Athens Conservatory and studied singing. He studied also conducting and composing. In 1993 he studied the Italian Repertoire in Cremona under the Italian Baritone Aldo Protti. In 1994 he was awarded the "Aldo Protti Golden Medal" and in 1995 won "First Honorary Mention" at the "Maria Callas International Singing Competition". As a member of Greek Opera house (1995-1999) he sings Belcore / L´Elisir d´amore, Don Carlos: Ernani, Papageno / Die Zauberflöte, Figaro / Il barbiere di Siviglia, Guglielmo / Cosi fan Tutte, Eugen Onegin. 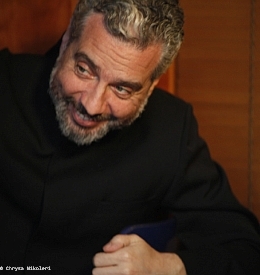 From 2000 to 2006 as a leading Baritone at the Deutsche Oper am Rhein in Düsseldorf, he sings: Posa / Don Carlos, Germont / La Traviata, Enrico / Lucia di Lammermoor, Conte / Le nozze di Figaro, Don Giovanni, Figaro / Il barbiere di Siviglia, Dandini / La Cenerentola, Taddeo / L´Italiana in Algeri, Silvio / I Pagliacci, Ulisse / Il ritorno d´Ulisse in patria, Guglielmo / Cosi fan Tutte, Oreste / Iphigenie en Tauride, Eugen Onegin, Il Ritorno di Ulisse in Patria (Monteverdi) Hamlet and Pelleas. Besides he has given performances in Hamburg : Odysee, Sofia Il barbiere di Siviglia, Pisa, Cremona, Mantova, Como, Brescia Don Giovanni, Torino Maria Stuarda, Firenze, Montpellier Il ritorno di Elena, Bonn Il barbiere di Siviglia, Mannheim Lucia di Lammermoor, Strasbourg Don Giovanni, Virginia Opera Don Pasquale and at Carnegie Hall in New York Electra, Bajazet / Tamerlano and Achillas in Athens, both available in CD, Figaro at the Staatsoper Berlin and Germont La Traviata in La Monnaie Brussels, Lucia in Tours, Olivier / Capriccio at the Opéra National de Paris, Enrico / Lucia in Amsterdam, Falke / die Fledermaus in Lausanne, Alfonso / La Favorita in Montpellier, Guglielmo / Cosi fan Tutte (cond. Ivan Fischer) in Las Palmas and Budapest. Falstaff (V. Jurowski / R.Jones) at the Glyndebourne Festival (available in DVD), Figaro / Il Barbiere di Siviglia in Rouen, Andromaque / Gretry in Paris, Brussels, Montpellier and Schwetzingen available on CD, Don Giovanni in Budapest and New York, Don Carlo in Frankfurt, Monfort / Les Vêpres Siciliennes in Genève. Upcoming: Figaro / Il Barbiere di Siviglia in Vienna and in Paris, Faust, Il ritorno d'Ulisse in patria and i Pagliacci in Paris, Macbeth in Bordeaux, Germont in Nantes and in Geneve, Don Giovanni in Las Palmas, u.a. He collaborates with major greek composers, and has recorded among others, works of Manos Hadjidakis, Mikis Theodorakis, Nikos Mamangakis. Furthermore, he composes himself. He has written music for the theatre, two ballets, an arrangement of the Little Prince as a fairy tale for narrator, actors and singer, songs for piano and orchestra, solo piano works and a musical based on A Christmas Carol by Ch. Dickens. His works have been performed in Greece – the Little Prince, A Christmas Carol (live tv broadcasted) Ritter, Dene, Voss(theatrical play), On The Road (ballet), Labirinth (ballet), 7 Songs by e.e. cummings for mezzo-soprano and orchestra, Germany- 3 Folk Dances for Piano Solo, 6 Greek Songs for Voice and Piano, U.S.A. – A Christmas Carol and U.K The Thomas Moore Songs.